The smiles were large and the hopes even bigger — but the odds were long. As many as 700 boys and girls attended an open casting call on Sunday to try to win six spots as von Trapp siblings in the upcoming NBC live broadcast of "The Sound of Music" opposite Carrie Underwood. During a grueling day, the hopefuls were split up into seven rooms in the Grace Church School so casting directors from the Telsey + Company agency could weed out the potential gems. After an initial screening, potential candidates were sent to a special room overseen by agency founder Bernie Telsey, who estimates he saw at least 80 children. He said he fell in love with about 10 candidates and will call-back up to 25 to be seen by the show's directors. "I think we found someone from that open call. Someone from that will be in the show. That's how confident I feel," Telsey said later. Next stop: A singing and dancing role in front of millions live on TV on Dec. 5. "That's so exciting. It's wild when you think about it that way," he said. 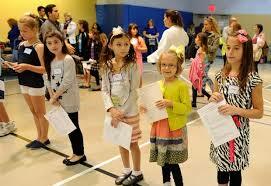 The spots available were for Louisa, Brigitta, Marta, Gretl, Friedrich, and Kurt von Trapp. The role of Liesl, the eldest of the seven von Trapps, will be filled by a professional since it's a larger role, including tackling the song "Sixteen Going on Seventeen." The rest of the cast will be made up of Tony Award winners Audra McDonald, Laura Benanti and Christian Borle. British actor Stephen Moyer, best known for his role as Bill Compton in HBO's "True Blood, will portray Capt. Georg Von Trapp. The Rodgers and Hammerstein musical debuted on Broadway in 1959 and the 1965 film starring Julie Andrews won the best picture Academy Award. The open casting call — for children who can play between 6-14 — will be supplemented by traditional casting methods, such as agents and managers. The one over the weekend was the only chance for starry-eyed children to get a shot who have no show biz connections. "Anytime we're doing a kid project we try to do that," said Telsey. Each candidate was asked to sing a part of a song they brought in or pick from among four songs the kids sing in the show. If that went well, another song was performed. Then Telsey would test out their ability to take direction. "It was surprising to me how many of them did not know 'The Sound of Music' music. It didn't come naturally to them because they're so many generations younger. It's not like they've watched it over and over like they have 'Newsies' or 'Annie.'" The ones who eventually survive the process will begin a six-week rehearsal period starting in mid-October. The live element of the telecast means a certain quickness is expected of the candidates. "You are looking for kids who are going to be fast, kids who can take direction and kids who can run with it," Telsey said. "There's not going to be time to dilly-dally."